Special to the DailyEric Wardell, left, and Phil Gould own Tree R3 Forest Mitigation. They'll haul logs off your property using a combination of modern techniques and Belgian draft horses. Business name: Tree R3 Forest Mitigation LLC. Location: Eagle and Ouray counties. Date opened: Our business is new to the Eagle Valley this year. Owners: Eric and Sarah Wardell; Philip and Krista Gould. Contact info: Call 970-376-6197 or go to http://www.treer3forestmit.com. What goods or services do you provide? Tree R 3 is a full service property fire mitigation company for all tree and ladder fuel bush removal. We specialize in low impact draft horse log extraction by running a team of Belgians, either double or single, depending on the terrain and layout of the property. We hand fell with chainsaws and are able to remove large loads of trees away from the property with a self-loading log truck. Our support equipment includes a grapple skid steer and all log and tree pruning equipment. We are able to grind branches and bushes into mulch right on the property. We also have the ability to create custom boards and timber on site with a portable sawmill. What’s new or exciting at your place? 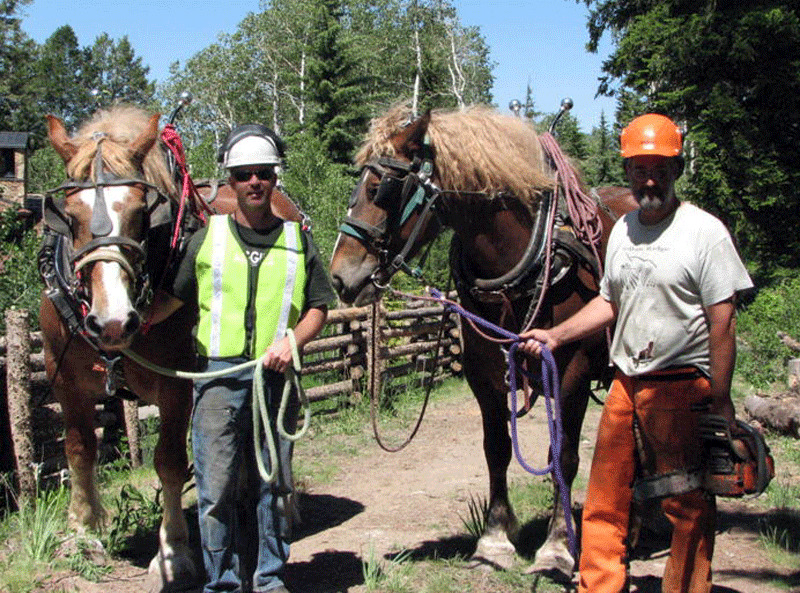 We are excited to bring modern horse logging to the Eagle Valley. Mixing an old world craft with modern support machinery is the best way to cut down on fuel consumption and relieve the forest floor of continuous machinery tracking. Horses create spot disturbance, which cuts down on erosion problems. The horses are regenerative and support local community businesses (hay, ferrier, vets, and so on). Their “engines” run on bio-fuel. What strategy do you use to differentiate your business from your competition? Tree R3 offers services that bring a craft from the past and creates a fun work environment working side by side with large, gentle, willing animals. With harnesses and chains that we attach to the felled logs we can pull out thousands of pounds of trees. The Belgian draft mares, Bell and Bess, love to pull. Their work ethic is bred into them. They enjoy pulling logs like a Labrador retriever enjoys retrieving a tennis ball. They will go all day long. Additional draft teams can be added together on larger jobs when the trees are over 5,000 pounds per log. What philosophy do you follow in dealing with your customers? What can your customers expect from you? We are Coloradans who love our state and understand the importance of healthy forest restoration. Cleaning up forested properties is helpful to prevent wildfire. Removing dead and unhealthy trees (especially beetle-killed lodgepole pine) allows the stronger trees to regenerate and grow. Our customers can expect knowledgeable, competent, trained tree fellers who thrive on hard work and have the knowledge of the scope of work involved to remove all the proper wood fuels from a property. We educate our clients on how thinning management not only protects their house from fire, but brings health back to the forest and surrounding wildlife. Tell us a little about your background, education and experience: Phil and Eric have been invested with their families in the Eagle Valley for more than a decade. Their knowledge of beetle-killed lodgepole pine is extensive, from salvage logging to building custom log and timber structures, saw milling and grade stamping structural beetle killed timbers and trim. We utilize every piece of wood that we remove for house logs, saw timber or fire wood. We encourage clients to view our website to see pictures and video of our work. What is the most humorous thing that has happened at your business since you opened? Watching one of the guys e-mail on their iPhone while holding on to the reigns of a draft horse.